Elagabalus, son of Julia Soemias and Varius Marcellus, was born at Emesa 205. While almost a child, he became priest of Elagabalus, the Syro-Phoenician Sun-god. It was from this circumstance that he obtained the name of Elagabalus. He owned his elevation to the purple to the intrigues oh his grandmother Julia Maesa. He succeeded to Macrinus after his death. He died attempting to put his cousin Alexander Severus to death in 221. Obverse: IMP CAES M AVR ANTONINVS AVG, radiate and draped bust right. Reverse: P M TR P COS P P, Roma seated left on throne, holding small Victory and scepter; shield to lower right. Obverse: IMP CAES M AVR ANTONINVS AVG, radiate, draped, and cuirassed bust right. Obverse: IMP CAES ANTONINVS AVG, radiate and draped bust right. 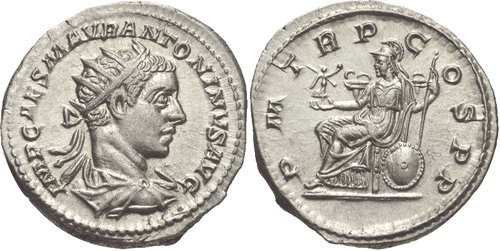 Reverse: P M TR P II COS II P P, Roma seated left, holding Victory and sceptre; shield at her side.